I move my body from side to side as I struggle in my seat and adjust my seat belt. I am on a trans-Pacific flight heading home to the Philippines. I am simultaneously uneasy and ecstatic. I tilt my head to lean on the plane's window, unsuccessful in my attempts to manage the mixed emotions flowing through me. I worry about my family back home, but I also feel pumped up by the good news that my recipes are featured in three - sorry, I still can't believe it! - in three publications. So, I try to focus on the positive and decide not to worry about anything. I am trusting that things will go well. So, instead, I focus on the reasons why I celebrate: I am visiting my mother, brothers, family and friends. - to score a hat trick! In the month of August, three of my recipes are featured in three different magazines. - how Angelina Jolie must feel whenever she is featured on magazine covers! But all jokes aside, I am grateful to the staff and writers who I have worked with to make these features happen. From the magazine Missouri Life, to my good friends Betty Ann Quirino and Nina Puyat - I thank you for featuring my sliders and spaghetti (Missouri Life), Adobo Burger (ABS-CBN's Food Magazine) and Pancit Batil Patung (Appetite), respectively. I've enjoyed working with you all. I have reached a major milestone since the beginning of my food blog. 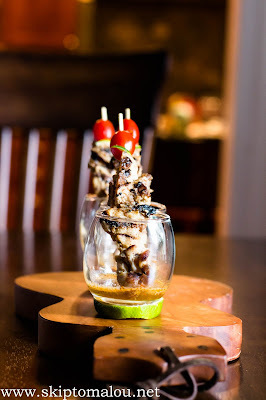 To celebrate, I am sharing with you my take on Chicken Satay. This dish is full of flavors, and the kicker... it's in the peanut sauce. Enjoy! 2 lbs boneless chicken sliced thinly. Make the satay marinade by mixing coconut milk, garlic, curry paste, galangal, fish sauce, thai chili. Season with salt and pepper. Marinate the chicken in the fridge preferably overnight or at least for an hour. Skewer the chicken and grill until cooked and slightly charred, about 3-5 minutes per side. Serve with peanut dipping sauce. I am sharing 2 variations of the dipping sauce. Mix all the ingredients in a pan. Let it simmer until it’s thick and creamy. You could also use the marinade itself. Just add sugar and peanut butter. Garnish with chopped roasted peanuts. Mix everything in a sauce pan over medium heat to round out the flavors. This Chicken Satay Skewers looks so good. It was great to write about your Adobo Burger and feature it in FOOD Magazine. I knew it was something my Manila readers (and here in the USA, too) would enjoy. I would have been remiss to not include it. Your recipes are always so creative and unique. Keep on cooking, pls. Thanks for the kind mention, Malou. Enjoy your family visit. God bless. I'll keep your brother and fam in my prayers! Safe travels, amiga! thank you Betty Ann (again) for the feature and most importantly thank you for the support as always. thank you also for the kind words and for the prayer. we sooo need them...lots of prayers! 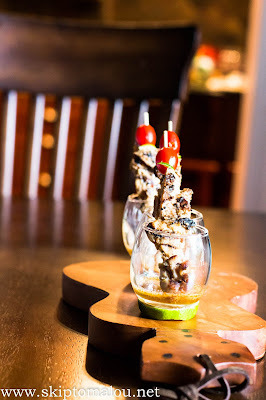 I love chicken satay, but haven't ever made it at home (but have wanted to many times. two peanut sauces? thrilled. I'm bookmarking these to try, because everyone in the house will love them. woop woop, you are one of the five bloggers featured in the magazine. congratulations. your photos are stunning I gain five pounds by just looking at them hahah. Fantastic! I am so excited for you Malou! You completely deserve it and should be so very proud!!! I hope you have a terrific trip home filled with love and laughter! Fantastic! Congratulations to you Malou- you completely deserve it and should be so proud!!! I hope your trip home is wonderful, filled with laughter and love! thanks Elisabeth! I am here for my brother and I am glad I made it here on time. Three? Congrats! That's a big deal. Have a great trip, and thanks for the recipe! 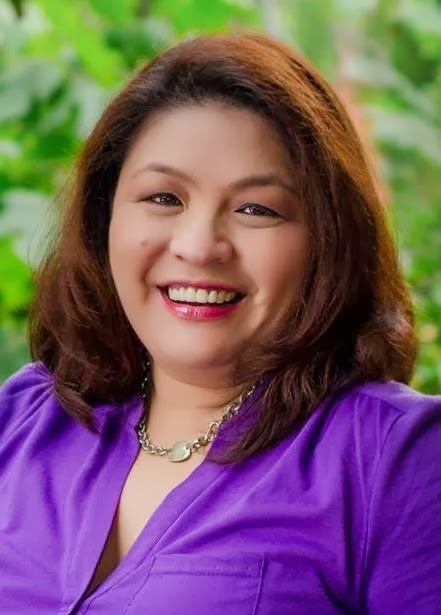 Malou, I'm so proud to know you as a famous 'food blogger friend' ...and to be featured in three magazines, wow...CONGRATULATION! 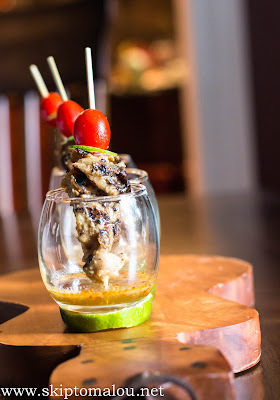 Your chicken satay is so awesome...love your creative touch and presentation, as well. I will save this recipe, especially for your divine peanut sauce. Do want to make this real soon! Have a wonderful trip and a great time in the Philippines with your family! almost a full cup left over. Of course having a delicious cup of sauce left over isn't necessarily a bad thing.